Another wonderful adventure under our belt! Every visit to the fabulous waters of the Lower Mountain Fork River of Southern Oklahoma seems better than the previous one. What could be better than fishing for (and actually catching) some of the most beautiful game fish in the country coupled with experiencing it with so many of the country’s best women fly fishers. This remarkable experience was shared by the following individuals: Kate and Gene Allen, Sheila and Robert Anderson, Pat and Don Carlson, Beverly and Roger Casey, Joyce Davis, Frances Estes, Marilyn Evans, Kay and Les Jackson, Kim and Mark Jackson, Mary Kay and Jack Janco, Chris Johnson, Stormi and Gary Johnson, Mary Kain, Diana Kunde, Sharon Leissner, Linda Malsbary, Rozlynn Orr, Keira Quam, Mary Rohrer, Julie Sieh, Kerri and Jim Stephenson, Susan Underwood, Linda Whiddon, Marilyn Young, and Lindy and Bruce Wilks. We renewed an old friendship by having Jessie King from Three River Fly Shop, be our featured speaker at our Mullet Mixer on Friday night. His presentation detailed the preferred techniques for the river during the winter months. He discussed rigging, fly selection, and presentation. Jessie also pointed out the best locations for the differing techniques. I’m sure that much of our catching success was attributed to his presentation. Well ladies, if you missed the Blanco Outing you do not know which member in TWFF can play the accordion, which member can tap dance, which member went to high school with Pee Wee Herman, and you missed a lot of good fun. The Blanco Settlement is such a cute setting. The best part is that RV’s, cabins and tent sites were all within close proximity. And this allowed us to spend a lot of time together. In fact many of us just hung around the Settlement. There was such good down time we fished, caught and learned new skills. This year’s Saltwater Outing was highly anticipated. After two fine years of great surf fishing, about 25 members headed south to the fun filled coast town of Port Aransas. Our headquarters again was the accommodating Executive Keys condos. The local fishing reports were filled with baitfish along the surf line, blitzes crashing, birds everywhere, and hot, hot jetty activity. A handful of members were early arrivers on Friday, Deb Williams, Merilyn Evans, Diane and Richard Blair, new member Yoli Medellin, Karen Gebhardt, Don and Pat a few others scouted the bays, jetties and surf. The weather was typical October Coast all weekend, overcast and light winds from the southeast…but no baitfish, no birds and NO FISH! TWFF members from all over the state joined us for the late July weekend to swap fish tales, tie flies, improve casting skills, learn about educating new anglers, and of course, fish! Several people camped at the Boy Scout Camp and others stayed in nearby Salado. We started the weekend with a Mullet Mixer with 30 in attendance at St. Francis Church in Temple, TX. About 30 people attended and enjoyed good food. We played a Fish Trivia game using Goldfish crackers as counters … in case people were still hungry after dinner. The big winners of amazing prizes were Chris Johnson and Jan Bates. Fishing The Slab and Long’s Fish Camp:Can I say, what a “doozy”? doo·zy /ˈdo͞ozē/ Noun Something outstanding or unique of its kind. Yep, I believe we can call the Kingsland outing a DOOZY! Just when I was thinking that our outings couldn’t get any better we get a little help from one of our members and it ends up blowing the outing out of the water. Talk about an ‘explosive top-water bite’! If you didn’t make this outing, then you should probably kick yourself in the shin. Member Judy Lunn was the icing on the cake or our ‘explosive top-water bite’. In planning the outing, Judy demurely inquired if she could sing for the group and teach us how to line dance. This sounded good so we welcomed her offer. Little did I know what we were in for. Judy has recorded a tribute album to John Denver using his band and she is currently auditioning for the TV show, the Voice in July. To that we say, GO JUDY, you definitely have our TWFF votes! She bills herself as the singing DJ and that seems to be an understatement to me. Not only does she have a beautiful voice accompanied by her virtual band, she is a wiz at entertainment and she’s a great line dancing instructor. Most of our members readily joined in the line dancing lessons and were tennis shoe scootin’, dirt-slingin’, grass-stompin’ beauties having the time of their lives. Judy treated us with tunes on both Friday and Saturday evening. My impression of our dancing anglers is that we need more lessons (hint, hint Judy), and that we are much better fish wranglers than line dancers. All to be improved upon at a future date! 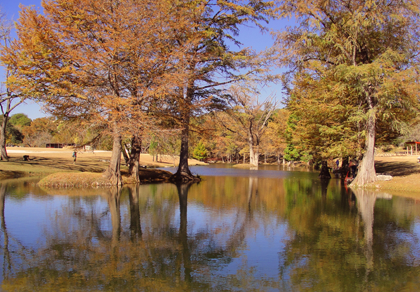 The Paluxy outing at Glen Rose, Texas, took place April 5–7, 2013 and was lots of fun, thanks to everyone who attended the outing! Don Carlson caught a huge carp on a 4 wt rod that took him 30 minutes to land, and most everyone else was successful catching bass or sunfish. 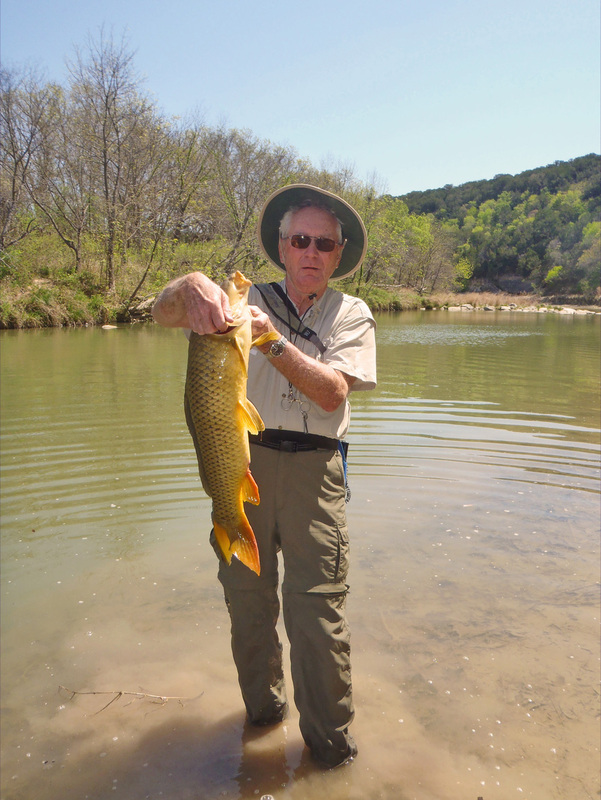 Don Carlson shows off his big carp catch of the day! We had a wonderful auction and a very big thanks to all who donated and bid on items to help make the auction successful! An extra special appreciation goes out to all who helped set up and conduct the auction! We raised lots of money for TWFF, CFR, and our conservation project. Upon moving this outing from the usual dates in January to the February dates, there was considerable concern regarding the weather. This proved to be wasted worry. What better way to spend a holiday weekend than to be on the water surrounded by two of God’s most beautiful creations? First, the majestic mountains and water of Southern Oklahoma, plus the presence of one of the finest game fish in the country. These are then coupled with the friendship of many of the country’s best women fly fishers. It is most understandable that this outing was such a great success. Is there a nicer little place nestled in the rolling Texas hills, cloaked by blue skies than Camp Honey Creek in Hunt, TX?…probably not. The weather was great, as was the company! The fishing, not as good as our last trip there in 2010, but several nice bass and sunfish were caught, oh…and 1 crappie caught by Frances! It was another successful Saltwater Outing for about 25 members of TWFF. We explored surf, flats and jetties. We used vehicles, ferries, kayaks, jon boats and our own feet to gain access to the waters of the Gulf, back bays and channels. Searching for and catching saltwater species; including plenty of cooperative ladyfish, redfish, speckled trout, a few Spanish mackerel and a bonnet head shark. The days were beautiful, calm winds and lots of sun. The surf was gentle, not too rough to wade and the falling tides brought baitfish within casting range for us to hook up the strong, fast fish in the waves. What a hoot! The blitz, the bait, and the birds make surfcasting at Port Aransas a wonderful experience and great way to enjoy our Third Coast. ALL TWFF’ers should experience the fun, the strong tug on your line of a ladyfish and ease of catching a fast saltwater species at the Coast. Fishing for Ladyfish in the surf makes for happy Texas angler-gals and guys!